Our youngest campers will spend their days enjoying a combination of teacher led activities and unstructured, creative playtime. We’ll learn to hold a baby chicken, bring food scraps to the piglets, and pick cherry tomatoes in the garden. 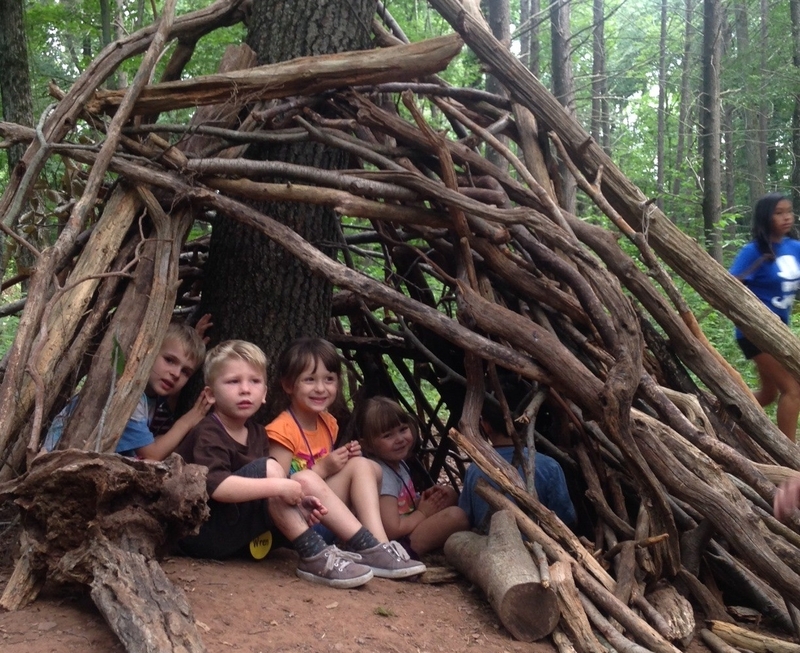 Sprouts campers will go on short hikes in West Rock Park, wade in the stream, picnic under shady trees, make nature art projects, and learn silly camp songs. Special themed days might include a daytime camping adventure with a campfire, marshmallow roasting, fort building, and time for creative play in Common Ground’s cabins in the woods and a Garden Tea Party Day with snacks made by campers with fresh foods from the farm. Favorite activities usually include lots of music and stories, water games, creative play in the mud kitchen, fort building, and cooking with food from the garden. Specific activities follow the cycles of farm and forest, and each week is a unique adventure, so Sprouts campers may be signed up for any number and combination of sessions. Our Sprouts Camp teachers are professionals who have lots of experience with early childhood education. The teachers are joined by a college-aged intern, high school student counselors, and several junior counselors, so we have lots of hands available to help our youngest campers navigate the farm and forest. Please see the “Frequently Asked Questions” page for more details on the qualifications of our camp staff. Sprouts campers do not have an afternoon nap time, but quieter activities are available as a choice after lunch for those who may need it. Which camp should I choose for my 5 year old? Sprouts Camp has a lower child to staff ratio than each of the other camp options for 5 year olds (4:1 vs 6:1). Sprouts Camp is based out of a classroom, and most other camps are based out of our small cabins in the woods. This air conditioned classroom home base provides a calmer, quieter setting for starting our days (but like other camps, Sprouts Camp is primarily outside during the day). Sprouts Camp offers a combination of active, energetic activities and quieter periods to the day (especially after lunch when some children might be used to having an afternoon nap). It is a great fit for 4 year olds, and it might be the best choice for 5 year olds who have never attended a summer camp before or who are shy about warming up to new situations. Camper/Staff ratio: One adult camp teacher and one camp counselor for every 8 children (4:1 child to staff ratio,not including interns or Junior Counselors).